Our wide range of products and services covers everything from posts and panels to garden furniture and chain link security fencing. Using the highest quality materials, and working to the very highest standards, we can take care of all your timber and fencing requirements. We manufacture majority of gates on site so are able to keep large stocks of common sizes, or should you need a special size gate to fill that gap we can help. For the gates not made on site special sizes and styles are also available to order. We have all the materials you need to build a deck for your garden from varying thickness of timbers for the frame to different lengths of deck boards depending on the size of your deck. Also available are hand and base rail to add a border around your decking project. We are manufactures of various specification new pallets including four way entry, and two way entry pallets, we also offer a heat treatment service and can also offer cut to length pallet wood so you can repair your own pallets plus packaging crates to order. Second hand pallets also available. We have available such a vast variety of tools and fittings, ranging from specialist fencing tools such as wire straining tools to everyday items such as hammers and saws. Same with our fittings we have specialist wire joining fixings to a variety of screws. We keep a variety of bagged materials on our large site including sands, stones and ballast! All available in various sized bags including 20kg, Midi which is approximately 500kg and maxi which is approximately 900kg. Due to our vast range of our products we couldn't categories everything we do so our everything else section is the other products we have available this includes Sleepers, Log Roll, graded Kiln Dried timber plus so much more. 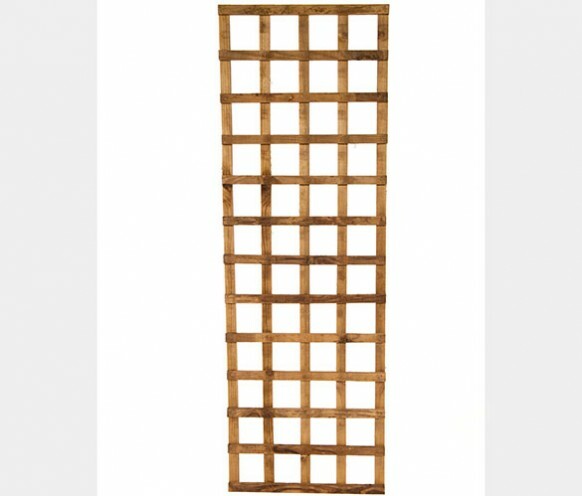 We manufacture all of our trellis on site so we can make a variety of sizes and styles to suit your needs, we can make convex top or concave top, diamond or square with various hole sizes, contact us for more details. Our wide range of products and services covers everything from posts and panels to garden furniture and chain link security fencing. Using the highest quality materials, and working to the very highest standards, we can take care of all your timber and fencing requirements. Large or small, everything we do is delivered with the utmost care and expertise. One of the advantages of having such a large site is that we’ve always got a huge stock of products and materials available for immediate collection. Which means that you can get on with your job with the minimum amount of fuss. And if it suits you, we can even deliver! We’re open early every morning, six days a week. And our staff are on hand at all times to help you get just what you’re looking for. So why not pop in and see what we can do for you?